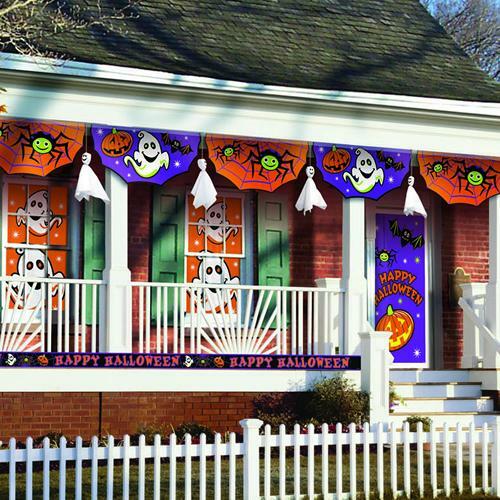 Get all of your outodoor Halloween decorations in one convenient package! The Ultimate Halloween Outdoor Decorating Kit contains 13 PIECES of all-weather, plastic outdoor decorations. Each package contains a 20 ft. Halloween Fringe Banner, a 30 ft. 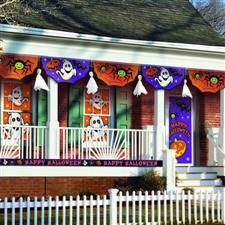 Plastic Bunting, two 65 inch window decorations, a door cover and eight hanging ghosts! Each piece is made of heavy plastic that will hold up to any type of fall weather and it is even durable enough to use year after year!